The Old Man and The Sea in some ways has succeeded to defamiliarize the worlds; the real and the fiction. It succeeds to blur the fact and the fiction. The elements within the story are imaginative chains to make the flow of the story in certain way to be amazing. Readers are brought to the setting Cuba during 15 – 19 September 1949 in Cojímar town. 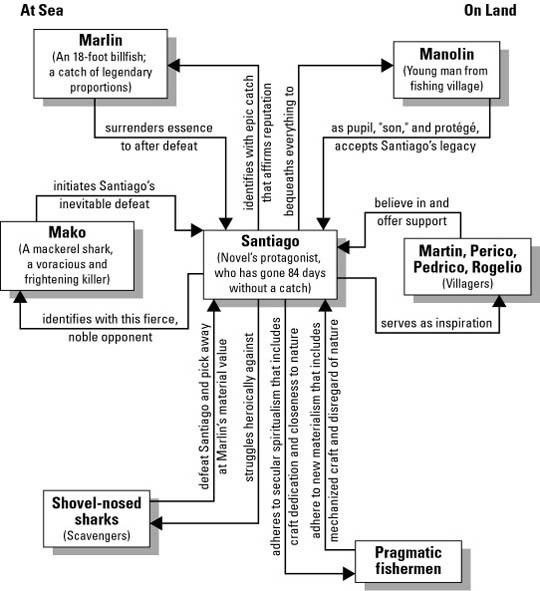 The story of Santiago in the novel is arranged so well as if it really happened. The novel itself also gives a didactic message. It says that we do not know the result of the struggle of every man. It teaches the readers to give their best in life whatsoever the result. Which one from those three stories has better ending? Yes indeed, The Old Man and the Sea is a great completion for a novel as Baker says that the novel itself stands as Hemingway’s epilogue of writing. The Old Man and The Sea according to close reading signifies a symbol of a struggle of a man in this world. Close reading succeeds to capture the force of the novel The Old Man and The Sea. The novel’s force lies upon the defamiliarization within its story. 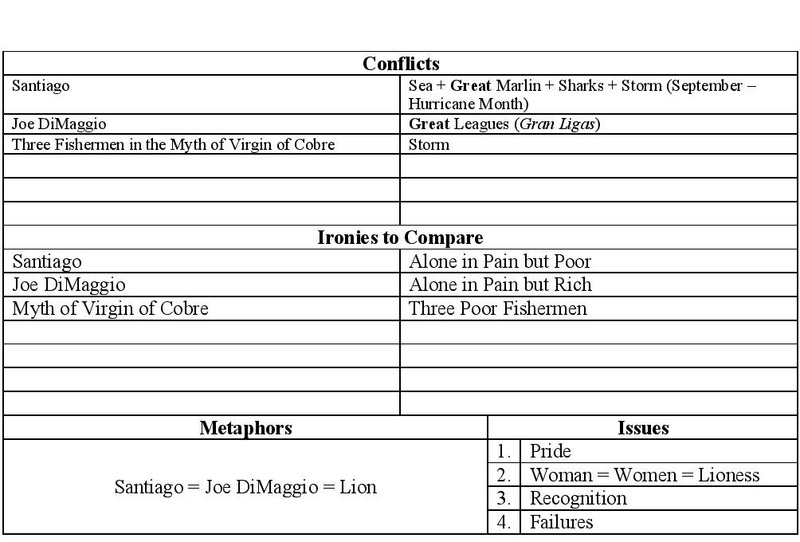 The close reading over the novel reveals three subjects of the story; the story of Santiago as the main character of the novel, the myth of Virgin de Cobre, and the story of Joe Dimaggio. The previous graph shows that these three subjects raises a great question to the close readers: Is it fair to judge people by their achievements? and the novel has the answer: It is not. The Old Man and The Sea, as the title saying, clarifies that all of us are just a lonely old man carrying out our skiff on the sea and being recognized by our granted achievement from God. It is the luck making us differ from others. Reading a literary work needs a total involvement and comprehension. The revelation of literary work’s symbolic condensation will be successful if a reader get intimate to the work. The understanding of code within a literary work helps every reader in his reading process so the outcome, the meaning charged, is not just any given meaning. There are many approaches besides Culler’s structuralism approach that are available to conduct another analysis on the novel. 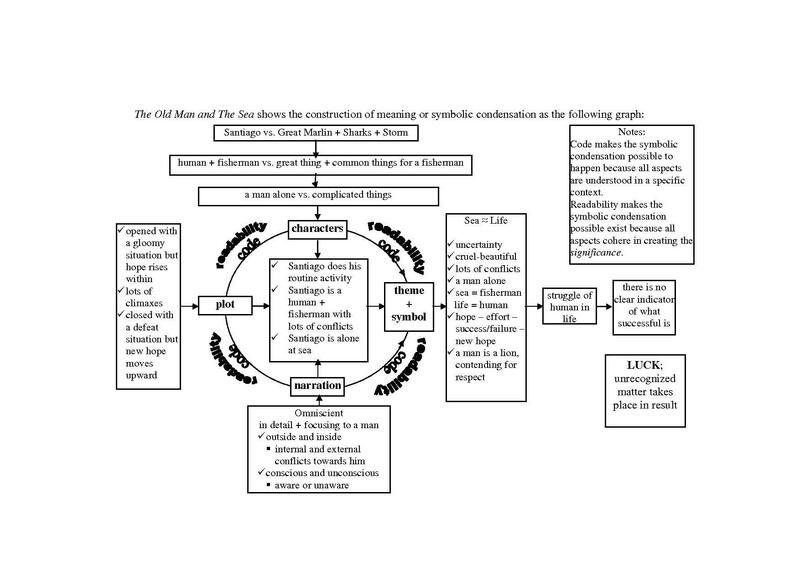 This thesis may be a good information and comparison material for other researchers who want to make another analysis towards the novel The Old Man and The Sea. Baker, Carlos. 1962. Three Novels of Ernest Hemingway. An Introduction of the Old Man and the Sea. New York: Charles Scribner’s Sons. On The Old Man and The Sea; A Short Note by Dipa Nugraha is licensed under a Creative Commons Attribution-NonCommercial-NoDerivs 3.0 Unported License. This entry was posted in Academic Article and tagged Culler, Joe DiMaggio, The Old Man and The Sea, Virgin of Cobre. Bookmark the permalink.